I haven’t been on BF.C in a while, but congrats on the new car! Glad I saw this story. I am sure you will love it. The M60 does make lovely power and glorious noises. Thanks, I miss the BF.C scene, too. I have seen my 540i around town and sad to say it is no longer well loved. The new owner has beat it. The GF and I talk about getting an E30 from time to time, but it really makes no sense until we have a house. 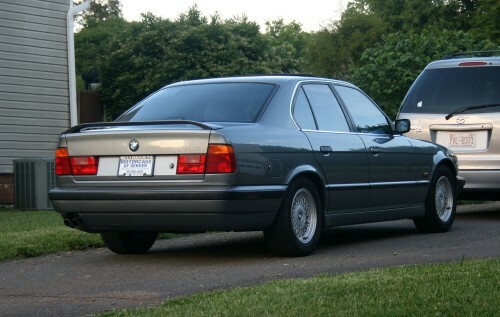 Did you sell your 525i or do you still have it? I’m really sorry to hear that, Mike. :( When I sell someone a car I almost hope they’ll take it far, far away so I won’t see it in a grocery store parking lot or on the highway and reminisce. 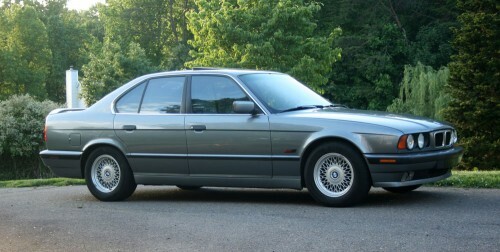 I’ve all but sold the 525i to another member in the E34 subforum. They’re coming to pick it up on Friday. I will be sad to see it go; it’s been a fantastic car for us. Glad to hear your car is going to another BF.C member, here is hoping it treats its new owner as well as it has treated you. I agree, I’d rather not see my car as it usually saddens me. It is odd, I am glad to not have to deal with the headaches, but I still miss it. When it was working, it was so much fun. Coming down in September again? Yea, I just seemed to have really bad luck. I’ll be honest, my E34 really soured me on used cars. 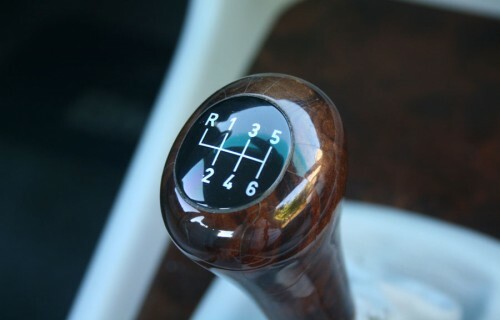 If I buy another old BMW in the future, it will be from a club or forum member and it will be a manual. Yea, I will most likely be down in September once again. I’ll PM you once I know when. Congrats! That is a clean E34! I have the younger generation E39 540i 6spd with the M62 (vanos). These cars are such an animal on any road. After I got my E39 I took to Asheville to visit my best friend who had a 400,000 mile E36 325is. This was the car that got me into BMW’s and we took my E39 up the same road that we had gone up in his E36. Once we got to the top and looked down I was like did we really just come from there in the E39? I daily drive my E39 and it is such an awesome drive. Im also on BF.C as well and look foward to seeing more of it. Congrats again and have fun with it! Thanks Phillip! You’re right; it is an animal. But it can settle down and be a cruise missile mile-eater as well. That bandwidth is one of the best things about it. 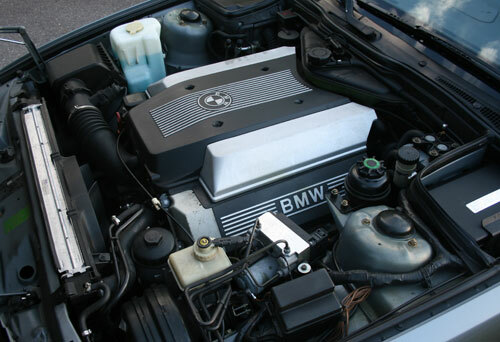 It’s very difficult, but not impossible, to fit a turbo to the M60 in the E34. Part of the problem has to do with the location of the vacuum brake booster, which BMW decided to locate up just behind the driver’s side headlights, instead of its normal location on the firewall. There’s an elaborate, beefy linkage connecting the brake pedal to the booster and master cylinder and that takes up most of the room on that side of the engine bay. 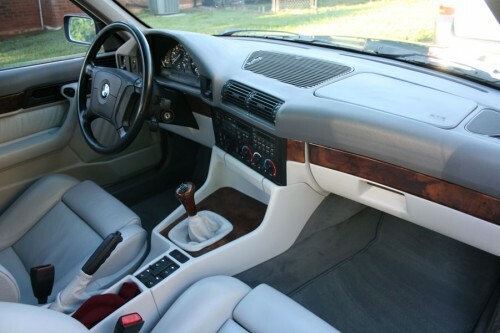 The bottom line is that the E34 540 is kind of a factory hot rod in the sense that the chassis was never really intended for the engine, but BMW really shoehorned it in. I love that they did; take an E34 and check off every enthusiast option (big engine, sport suspension, 6-speed) and you’d have the car above. How many automakers were so in tune with the desires of car buffs back in ’95? Nice ride! I’ve kept an eye on the 540i since a family friend bought one in the mid-late 90s and impressed me with its power…Worlds fastest sedan of it’s time, no? Not quite… The E34 M5 was half a second faster to 60, and the Alpina versions of the E34 were even faster, especially the king-of-the-hill B10 Biturbo. 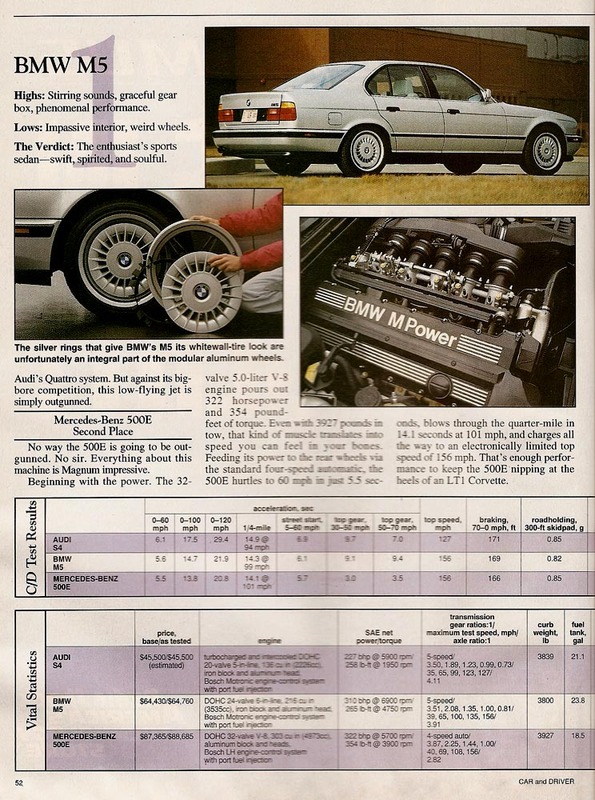 The Merc E500 supersedan (with the Porsche-developed V8) was quicker too, and the Audi S4 was pretty close. 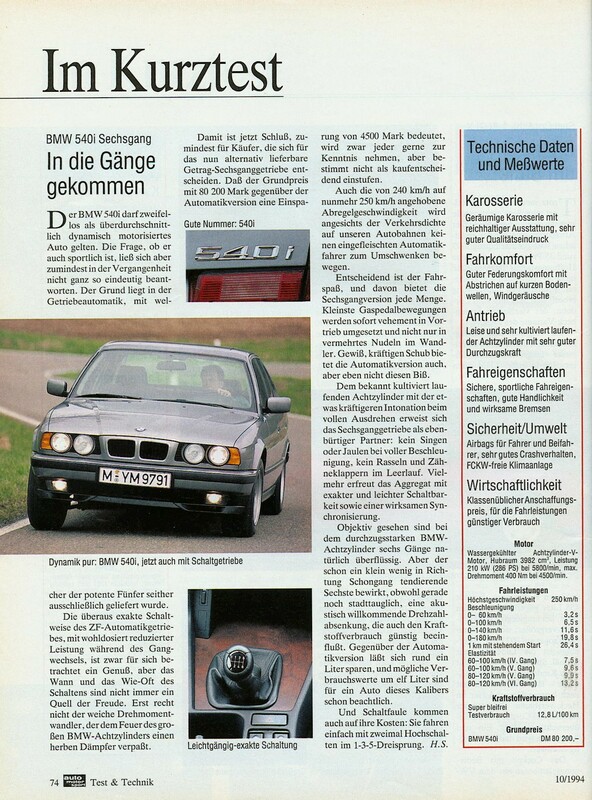 Congratulation to buying a Arktisgrau 540i/6 I had one myself, now my sister has it http://www.garaget.org/?car=185221 take care of it. The era has come to an end with the last 550i/6 F10 built last month. Thanks for the input. You have a beautiful E34! Inspiring for sure. Here you have better 540i/6 numbers http://www.kindel.com/BMW/fast_fives.pdf with an heavier car since the Nürburgring suspension makes it heavier. I know I have one. 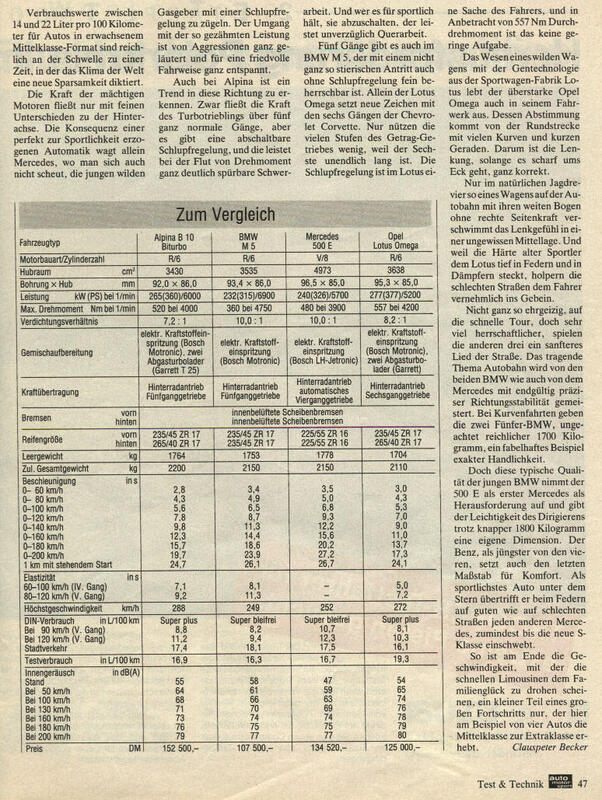 The 500 E/E500 in German magazines (several tests) always have higher numbers than 540i/6. 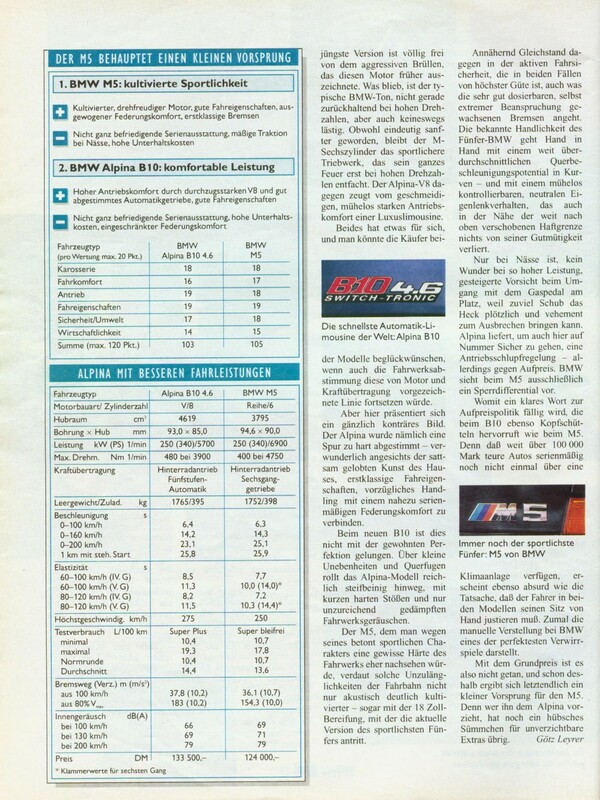 In MOT 22/94 an 1995 M5 did 0-100km/h in 6sec and the 1995 E500 needed 7,3sec (almost 540iA times, 540iA did it in 7,5sec). Wow; I find it hard to believe the E500 took 7.3 seconds to reach 100 kmh… Would like to see that review. You have a beautiful collection! Stunning. Oh yeah – I was gonna tell you about an easy way to deal with the shrinking door seals and forgot. If you can find any E34 in a junkyard, just pick up one of the door seals – you only need one. Then you remove your door kick plates, cut the existing seal right in the middle, then fit it properly to the door frame. When you’ve done that you’ll have a gap in the bottom of the door frame, right under the kick plate – then you just cut a piece of the extra seal you have to fit and keep it from ‘shrinking’ back in. Do this for all 4 doors and it’ll look like new. I’ve already done this and it works great! I’ve heard that tip, and that was the plan, although I wonder: Do the cuts in the weatherstripping show under the kick plate? And does it seal well enough down there?